Wind-torn, sun-scoured and torched by fire, the mountains at the Rooi Els Reserve may not sound the most appealing destination but what I saw there early one morning nearly made me choke on my bran muffin. It is easy walking at the Rooi Els Reserve but you’ll need to stay on the gravel road to avoid standing all over new plants. An hour’s drive from Cape Town, Rooi Els (pronounced ‘Roy Else’) is a modest village set on the False Bay coast under the looming presence of Hangklip – Hanging Rock. 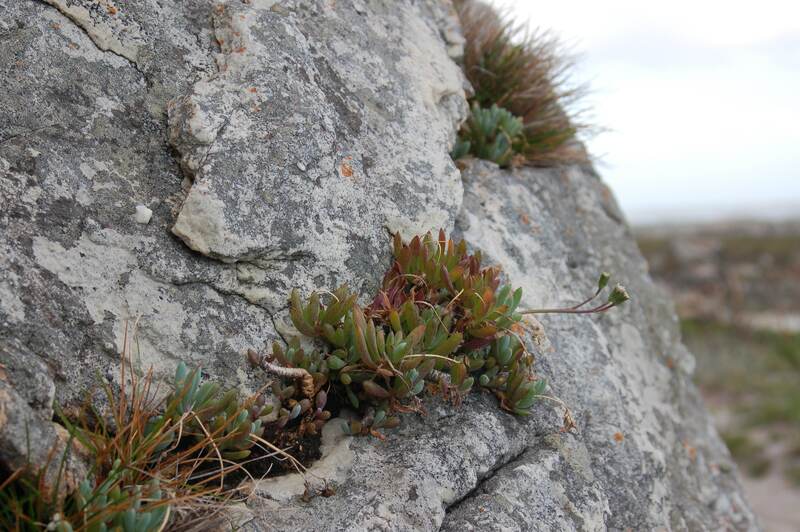 It’s where lofty mountains have tumbled down to sea level to deliver rare mountain fynbos plants at your feet, saving you the huff and puff uphill to where they are normally found. And as well as seldom-seen plants, Rooi Els is excellent for bird watching, home to local specials such as Cape Siskin, Orange-breasted Sunbird and Protea Seed-eater. It also has a well-deserved reputation for The Mega Tick: Cape Rockjumper – normally only found in high mountains. Calling all Birders! Rooi Els is the best place near Cape Town to find the super-local Cape Rockjumper. It’s not easy botanising though. 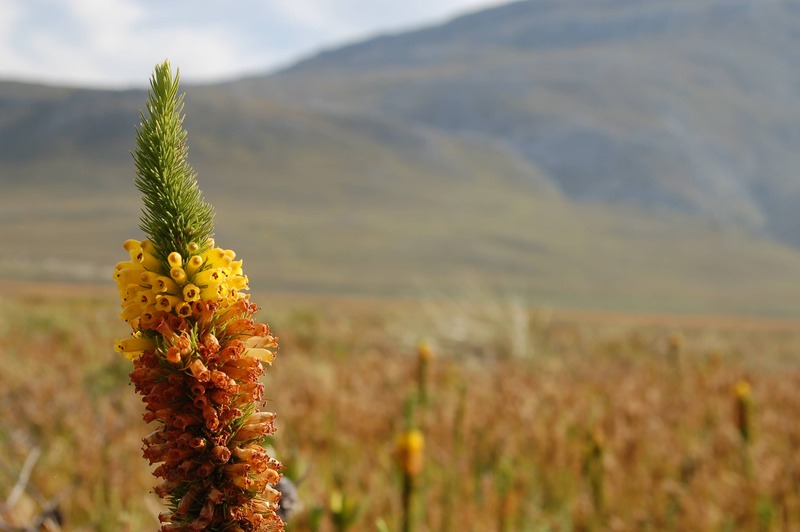 Although this side of False Bay has as many plant species as there are on the Cape Peninsula, half of them are different. Your guidebook to the flowers of Table Mountain carries little currency out here even though you can see the famous flat-top just 30 kilometres away. You need specialist field guides here, the sort of books you may have to blow dust off before thumbing through them. Stimulated into thick growth by the recent fire, Spatalla curvifolia is an odd-looking member of the protea family. 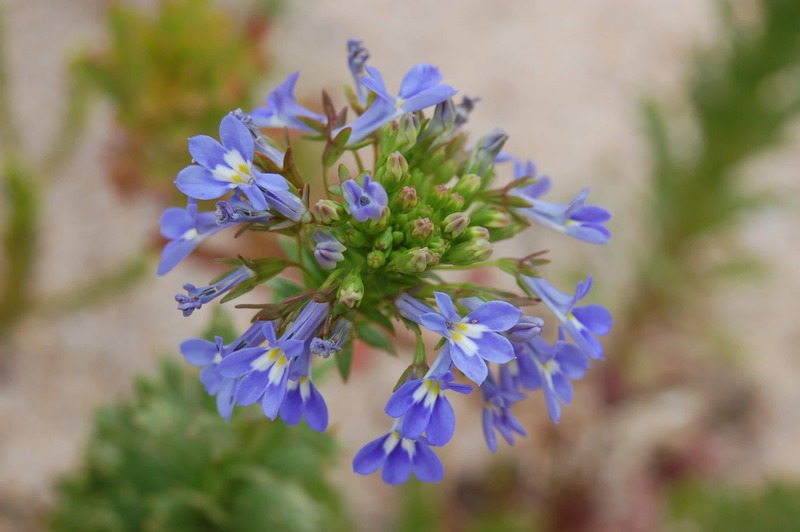 This especially pretty Lobelia stood out among the burnt rocks of Rooi Els. But all the page-turning is worth the effort. There is some really rare stuff at Rooi Els. Well, rare in the fynbos sense of being rare: locally abundant in an area of a few acres and then totally absent from the rest of the planet. Take Diastella thymelaeoides meridiana for example, an elegant member of the Protea family found only along this twist of coastline. Or scan the swamps behind the mountains and you’ll find Mealie Heath (Erica pattersonii), clinging on for survival in the few lowland patches that are not covered in holiday homes. 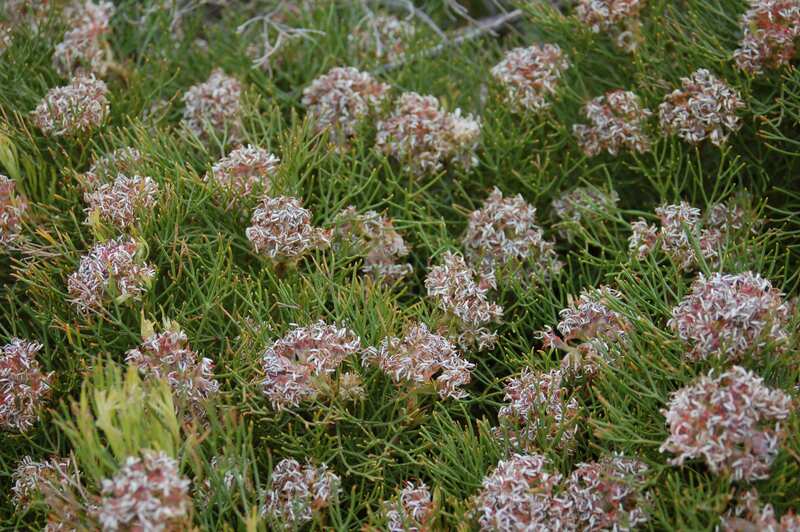 Diastella thymelaeoides meridiana – another protea – is restricted to a stretch of coast no more than a few miles long. 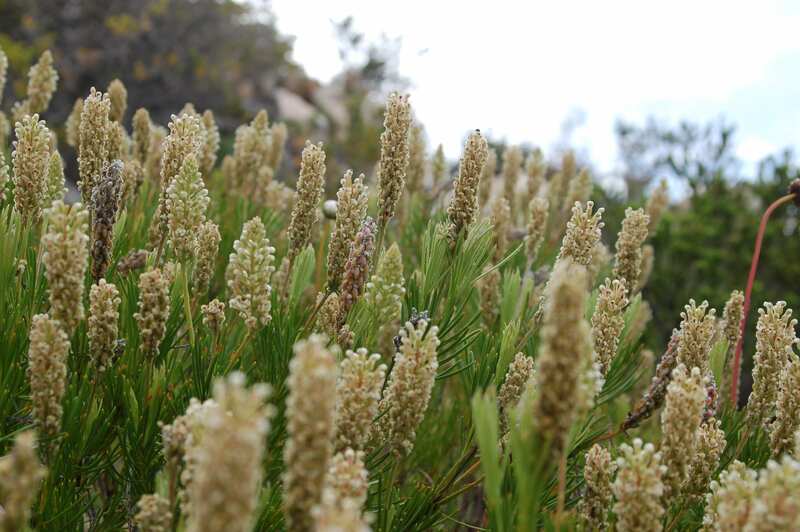 Named after its similarity to corn-on-the-cob, the Mealie Heath (Erica pattersonii) is one of the rarest heathers in fynbos. Besides rare plants, another reason the reserve is worth a visit is because it was recently burnt. 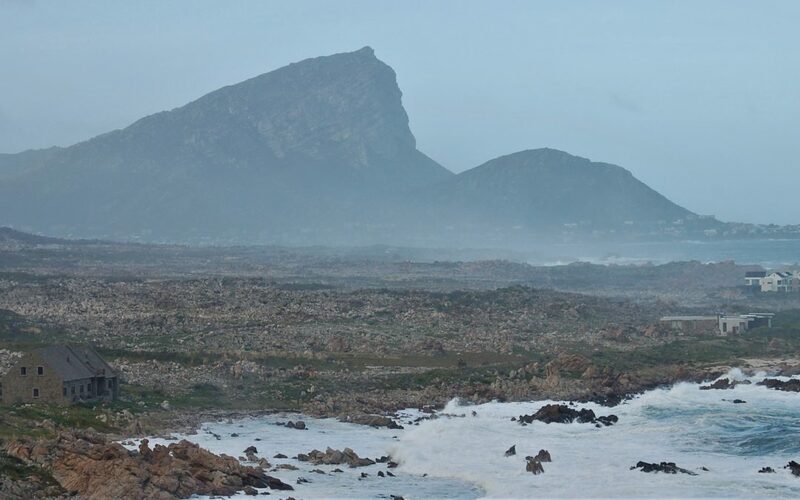 Evidence of the fire is everywhere – blackened tree stumps and singed rocks – but this of course only encourages fynbos and Rooi Els is looking especially colourful and productive at the moment. And being fynbos, there are always surprises in store. 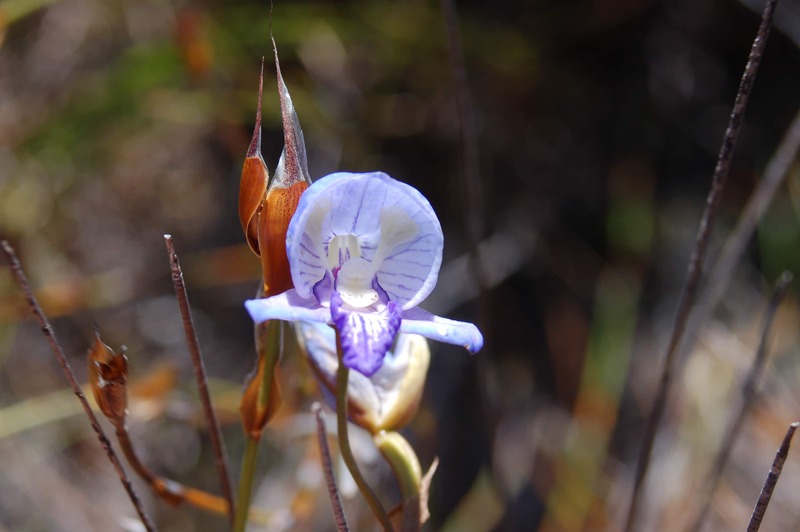 Hiking uphill to explore, I came across various orchids, their bizarre flowers twitching and bouncing in the wind. 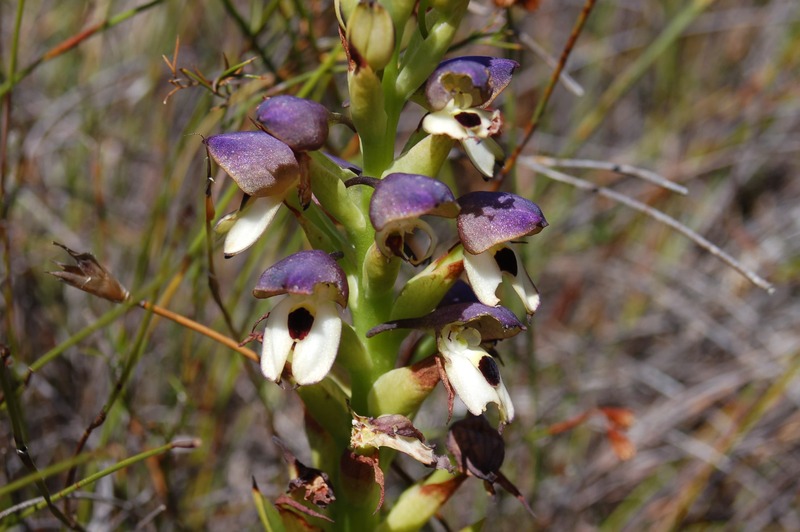 Indeed, South Africa is home to more types of orchid than Europe and North America combined and they are often found in the strangest habitats: dry stony ground; post-fire scorched sand; and cold, peaty wetlands. This orchid, Disa cornuta is called the Inkspot Disa on account of the black blobs on its petals. Another orchid, the rare Disa purpurascens, is similar to the more common Blue Disa (Disa graminifolia) but flowers in spring rather than summer. 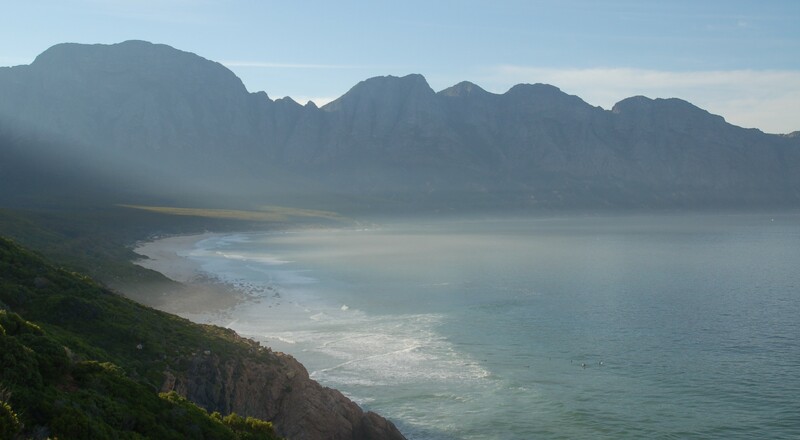 With top to bottom views of the Cape Peninsula – from Table Mountain to Cape Point – you’ll probably be most impressed with the scenery when you first arrive at Rooi Els. And from July to November you stand a good chance of seeing Southern Right Whales in False Bay too. But after an hour of relentless panoramas, you might find yourself looking a little closer at the flowers. Now you’ll start to notice ecological relationships at play – pollinators such as monkey beetles and predators like crab spiders and hairy caterpillars. Keep an eye out for baboons too: they don’t seem to be particularly bothered by humans as I found out when I stopped to observe a troop before realising that it was they who had settled down to watch me. 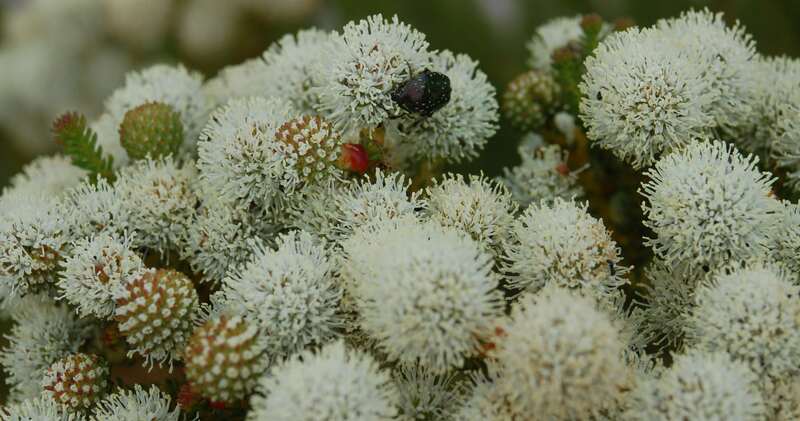 A Chafer Beetle moves in on the pop-pom flowers of a Berzelia or Button Bush. 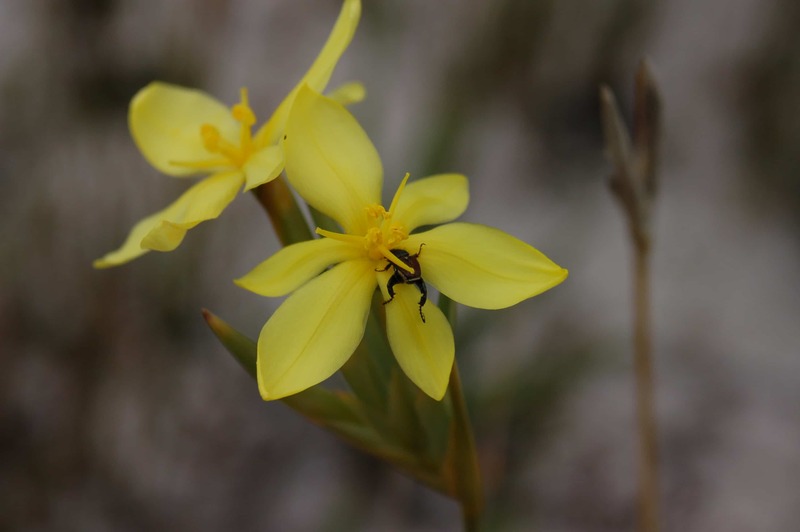 Another pollinator, the Monkey Beetle, scrambles its way into the sweet zone of a Bobartia, a type of iris. The Rooi Els Reserve is a private one but accessible to the public. It offers easy walking – you simply stroll along the gravel road which runs along the base of the mountains – though it’s not an easy place to find and it’s equally difficult to get a day there where you aren’t retrieving your hat every minute – it’s really windy. There’s also no shade, no facilities and no water. 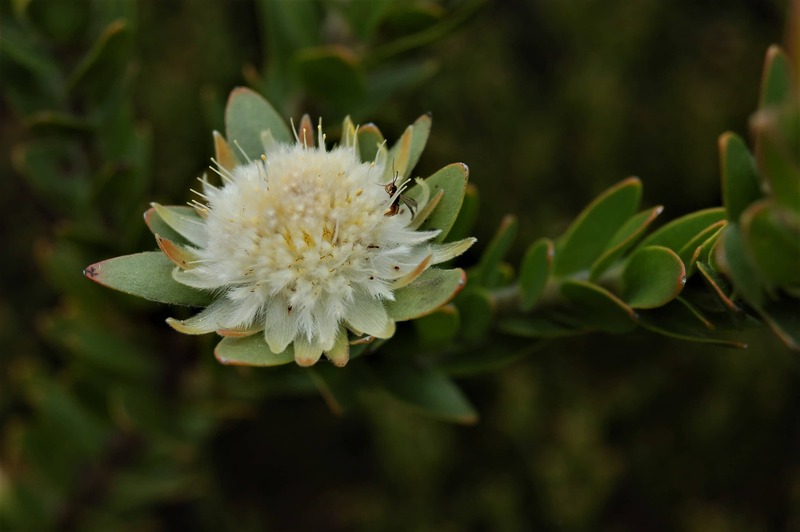 The fluffy flowers of yet another Protea; Serruria adscendens or the Kleinmond Spiderhead – common in this area. But only this area. 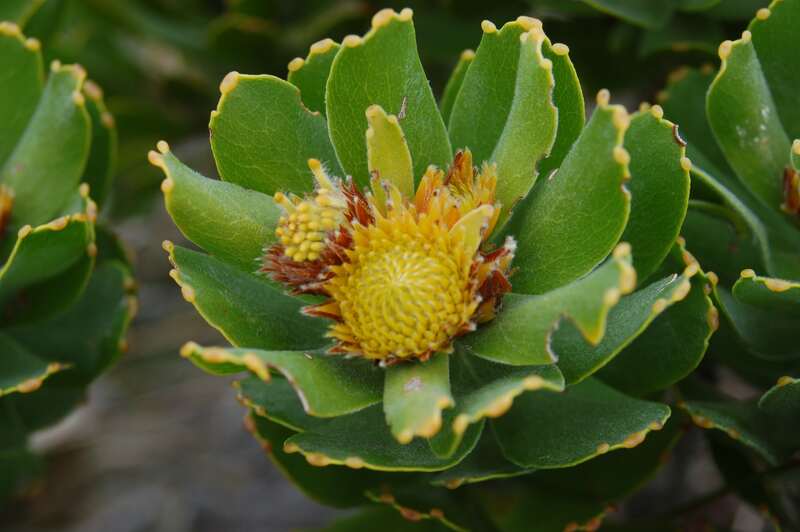 The Overberg Pincushion (Leucospermum oleifolium) is another local protea & grows in extravagant stands in the nearby Kogelberg Biosphere. Succulent plants find a home in the cracks of rocks where they are protected from fire – this fat-leaved sprawler is in fact a type of daisy. But Rooi Els lies at the start of a collection of fantastic destinations tucked away on the Overberg coast: Stony Point Penguin Colony, the Kogelberg Biosphere and Harold Porter Gardens – and these are the relatively well-known ones: wait until you check out the fynbos at the Hangklip Reserve or the birding hide at Rooisands Reserve. Birding, flowers, scenery, wildlife, whale-watching and the marine world – it’s all there. And the view on the way back to Cape Town isn’t so bad either. 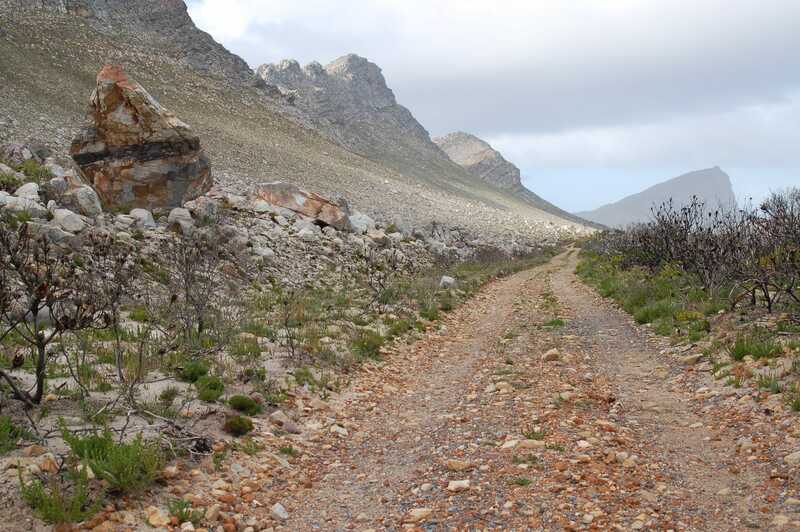 The views along Clarence Drive – the way to & from Rooi Els – are some of the best in the country. Lovely blog , thank you !